Google has a few comments to make to those pesky Europeans that claim it is taking unfair advantage of its monopolistic digital services. Actually, the memo that Google's CEO Sundar Pichai just posted on the corporate blog is probably aimed to preempt the tsunami of media coverage over a giant and imminent $5 billion fine that was just imposed on Google by the European Commission (EC). The crux of the issue is that according to EC, Google is mandating that Android phone makers use Google Search as a default search engine and Google Chrome as the default browser, thus blocking the competition. Given that the complaint was filed by a lobbying group of the competition itself, including companies like Microsoft and Oracle, we wouldn't be so fast to judge, and Sundar Pichai begs to differ regarding the monopoly accusations. 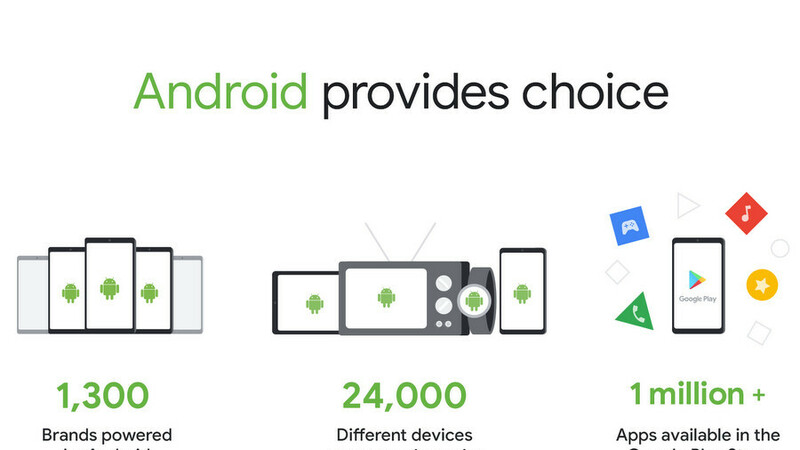 As you can see from the visual materials, Google's CEO argues that Android has created infinitely more choice in the mobile industry than there was before it, and if you don't like a stock app, uninstalling it and choosing something else from the more than a million of apps at the Play Store, is a matter of seconds. He also adds that phone makers choose whether to pay Google a nominal fee that covers development and distribution and include its suite of Gapps, or not. Most Chinese phone don't come with Google services preinstalled, for instance, as its search service is banned in the country. Phone makers don’t have to include our services; and they’re also free to pre-install competing apps alongside ours. This means that we earn revenue only if our apps are installed, and if people choose to use our apps instead of the rival apps. There are a lot more valid points where that came from, but if the European Commision has decided to set an example for the American digital juggernauts, Google might have to pony up something in the end anyway. The verdict seems a done deal, as Google ends up the blog post with an appeal intention and the #AndroidWorks hash, noting that "the decision ignores the fact that Android phones compete with iOS phones." Word. Well, if EU wants OEM to be able to run Android forks and use others third party adds using your data, let them have what they want. Just don't count on getting any other services either from Google. Enjoy your vanilla forks EU. I disagree. Android is googles product. Why don’t they call ford and tell them how to build their cars. If anything it’s Apple that doesn’t even let you set a 3rd party app as a default app. Yes you can delete stock apps and features but as soon as you want to use any feature that requires an similar action iOS will tell you to install that native app right back. Attack Apple. Google has been the most open and inviting ecosystem - what EU is doing is ludacris. How does Apple get over this? Why do folks always bring Apple into everything? Unlike Google, Apple uses their own OS and hardware, they don't license their os to anyone else. The problem for Google is that they want the benefit of what an open os provide without any of the strings that's attached with such OS. You fall under a different set of rules once you license an OS to third party instead of using such os yourself only. Microsoft had to go through this, and it's a good thing the EU force microsoft hands back in the day or Google might not be around today. It's funny reading Google's response to this. They sang a different tune back when the EU went af. "The market favors open choice for search. We don't think it's right for Microsoft to just set the default to MSN. We believe users should choose." Google in May 2006. Because they are committing the same crime but not being judged. It's like 2 republicans colluding with russia and only one going to jail when both are equally guilty. MS got smacked because they were doing anti-competitive things. IE was the only way to update windows which was a stupid lock in. They were forced to change that. Google services are not required to run Android, they are only needed to run other Google services. The EU wants the play store without the tie in of default chrome and google search. It has nothing to do with an "open OS" or whatever you believe justifies Apple's exclusion from this. Final flash - I do agree with you. Apple is bigger control freak - google is the least controlling of any OS. Back in 2006 it was rather difficult to install another browser on PC and make it the default. It was too complicated for most users. On Android it takes all of 30 seconds to install and set a new browser default. Google doesn't sell the Android OS. It sells the Google suit of apps which includes search settings and they must be used as defaults. OEMs can use Android 100% free if they are willing to give up access to the play store. Chromoid, you’re wrong about google - it doesn’t sell its OS or access to ecosystem literally in full. But google has to keep some control over their baby. I say google needs even more control and force appps like hangouts or duo to be default necessity on all android - iOS has FaceTime and it’s a wonderful feature because I know anyone with iOS can FaceTime me or me FaceTime them even if you have an iPad. Having. A standard in an ecosystem is a good thing - google services and googles own apps is that standard! Screw Google. So many good OS died because of it "free" to use first impression. It's actually super expensive OS when you factor all the tracking and advertising they do on us. Just to name a few: WebOS (was a fan) BB10 (was fan) Maemo/MeeGo (that one may be MS faulty). And of course, Windows Phone (was not a fan) Not to mention they were super slow to make it usable. 7.0 was the first version out of Beta in my opinion. That's almost a decade. Look at the other OSs and at day 1 they were ahead of their time. Here's what you do. If you don't want to use chrome on your phone? Just download another browser from the Play Store. Problem solved. If you don't like Android, Get an iPhone or Windows Phone. The stupidity of others isn't our problem. how is them "not looking for a replacement" the same as forcing them to only use whats provided? Windows phone does not exist anymore.. So why didn't the other OS switch their business plans? I mean, when your competitors change price, you change price. So why didn't the other companies give away their OS and sell suits? Utterly ridiculous that Google is being fined 4 billion Euros. If I was running Google, I wouldn't pay it. What is the EU going to do, not allow Chrome or Android phones into any EU country? They would have a riot on their hands. Nothing but a PC money grab. If they don't pay the fine will increase and if they continue to ignore it...in the end ban in Europe is the only solution. Search bar is easy to remove, too. Don't get Scroogle by Google. I like how Google blatantly lies in their infographic about being able to "just uninstall" default apps. Most if not all of their apps are flagged as system apps and thus, can't be uninstalled without rooting (another thing Google is trying to kill). Why in the bloody f**k is Play Music or Play Videos required for system to run properly? Yeah 100% agree. All of the Android devices I have ever bought, had Google apps loaded in system that couldn't be uninstalled. They probably should have shown the disable screen and set defaults apps page, but maybe that wouldn't have made such a direct impact. Blame OEM for that, it's most likely because custom UI from OEM.. You can disable all google apps (including play store) and your smartphone still run just fine.